Left to Right: Kenner POTJ R2-D2 with launching lightsaber, Hasbro Vintage Collection R2-D2 (VC25), Hasbro Star Wars Black R2-D2, Kenner POTF2 R2-D2, Taco Bell R2-D2 from the Special Editions promotion, POTF2 Power F/X R2-D2. Back Row: Galoob Micro Machines play set R2-D2 (unfolds into Jabba's Palace!). Star Wars Black is a 6 inch line that seems to be in a pretty solid scale where one inch equals one foot. Standing straight up, R2 is about 3 1/4 inches tall. The style of these figures is quite nice and cohesive, and attempts to present these characters as realistically as possible. I'll also make mention of the very cool (and collector friendly) packaging these figures come in. The box is easily resealable and safely holds all of the character's accessories while putting the figure nicely on display. I don't keep packaging often but I'm making an exception for these guys. Note that I have more R2-D2 figures than pictured above; I just didn't bother looking for all of them. It was probably the fact that R2-D2 typically features such minimal articulation that many fans weren't eager to pick him up. I guarantee you, though, that the figure contains more articulation than you might expect. R2 features: hinged feet (each with two rolling wheels on the bottom), swiveling legs, a retractable third leg with a hinged foot and two wheels, and a rotating dome. The third leg descends when R2's dome is spun counter clockwise and retracts when spun in the opposite direction. Furthermore, R2 has two hinged panels on the sides of his body that when opened allow for his hinged claw arm and data port/universal computer interface arm to swivel out. He's pretty impressive, and everything works really well, although if you have larger fingers you may have difficulty getting the devices to swing out of the panels. Like mentioned above, there really hasn't been a modern R2-D2 sculpt that wasn't good. He's a character that Kenner and Hasbro have always nailed, so how much could they really improve R2 with just a larger size? It turns out that they were able to do quite a bit more. The engraved details on the body are spot on with the costume/prop from the films. The proportions are fantastic, the opening chest panels are seamlessly integrated into the main body, and the wires on the feet really bring things together. It's hard to go into too much detail, but I think it's sufficient to say that comparing the Star Wars Black R2-D2 with some large pictures of his film counterpart will show that he's about as good as he could be. The paint work was the source of a little controversy when the figure first started showing up, as this image started making the rounds and proclaiming that Hasbro had promised one thing for Star Wars Black while delivering something else. Honestly, though, when you look at this R2-D2 in person you'll be pleased. The lighting is kind of weird in that picture, and it masks that the Star Wars Black R2-D2 has a really clean, neat, and detailed paint job. He might be a little cleaner than some folks wanted in regards to the Star Wars "lived-in universe" aesthetic, but he's still pretty solid. He does have some grime on his treads, though. The only negative spot on my figure is that the blue line around the bottom edge of his dome is a little uneven in some places. R2's accessories are what really make this figure, however. They're incredible, plentiful, and easy to attach to the figure. First, I'll mention that a few of the parts of R2-D2's body are removable: three of the blue panels on his dome and the blue side panels on his legs can be detached to attach his additional accessories (the leg panels actually come detached in the package). They're small, so be careful with them, but they stay on nice and tight. In place of the blue leg panels, R2 can be fitted with his jet boosters, which Wookiepedia tells me are Brooks Propulsion rocket boosters. You might remember them from Attack of the Clones or Revenge of the Sith. Remember all those wiseguys complaining that R2 had jets and asking how he could have them if we never saw them in the Original Trilogy? Wookiepedia also informs us that the company that designed and manufactured those jets, Brooks Propulsion Devices, shut down sometime after the Clone Wars. Once R2-D2's jets broke, no one could fix them. Ahh!! Continuity! Anyways, they swap out easily and look really cool. For his dome, R2 comes with two of his sensor scopes. The one that's blue and white is his extendable auxiliary visual imaging system, and the smaller black and silver one that looks like a hi-tech spatula is his life form scanner. They both can snap into two of the three open slots on the rear of his dome. The third accessory, Luke's lightsaber from Return of the Jedi, easily slides into the front cylinder on R2's dome (which was originally used as a way to shoot out an emergency flare or expel excess water and junk from inside R2's body). Just seeing Luke's green lightsaber hilt gets me super excited for a Star Wars Black Jedi Luke action figure to be released! The only thing that could have been added to this guy to send him over the edge would have been a holographic Princess Leia. Star Wars Black was not a line I was terribly excited for, as I already have hundreds (and I literally mean that, and not that newfangled change of the word literal creeping into definitions--there are actually hundreds of Star Wars figures in my house). It is, however, winning me over. The way Hasbro is releasing small amounts of figures at a time in a pretty nice format really appeals to me. While I doubt that even if Star Wars Black becomes a continuous action figure line for Hasbro, I still doubt we'll ever see all of the figures from the 3 3/4 line in this line. I do have more and more hope everyday that we'll get the all of the major characters and their various outfit changes, though. R2 is an excellent interpretation, and does show what can be done in the 6 inch scale that is much harder to pull off effectively in the smaller scale. I'm giving him a Great and a 1/2, with a 1/2 point deduction because of the paint on his dome being a little off in spots. "The only thing that could have been added to this guy to send him over the edge would have been a holographic Princess Leia." That would've been amazing! But I'm actually pretty happy overall with this R2 figure - especially all the options he comes with. My only issue is that the join on the dome could have been cleaner. I don't know if mine is worse than others, but at some point he's gonna get the putty-n-paint treatment. That's a good idea for an accessory. 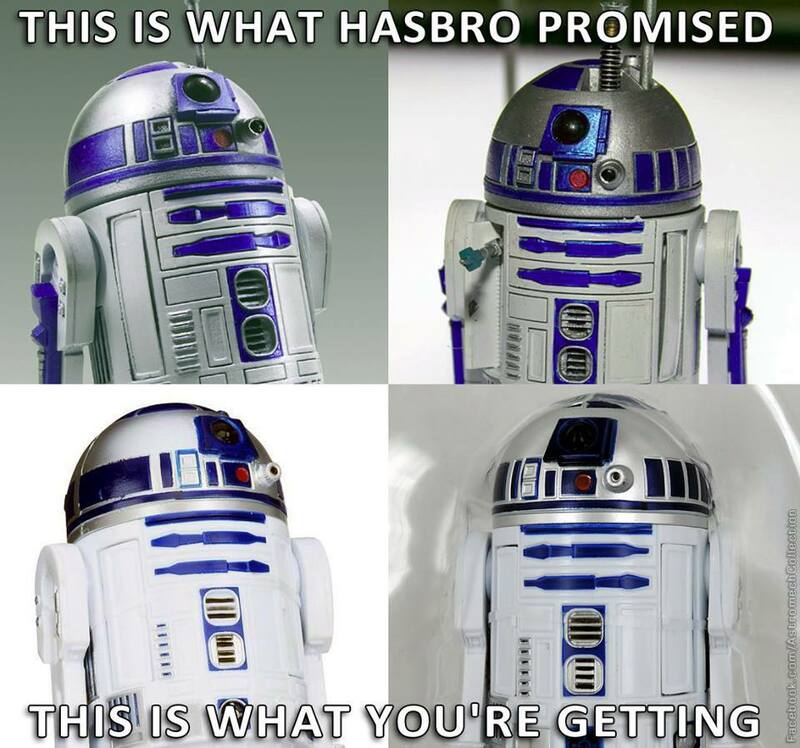 I do think R2 would warrant a rerelease down the road. Even if given a paint theme such as Tatooine sand or Dagobah swamp, the extra accessories (which could be used on the previous figure) would help to sell him.